Reading The Tipping Point makes me hate my sociology professor in college. I can’t remember ever being so hooked by a non-fiction read. And if this is what my sociology class could have been… well, I feel cheated. 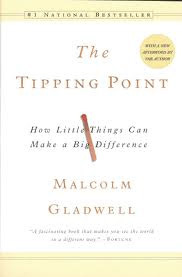 The Tipping Point: How Little Things Can Make a Big Difference is Malcolm Gladwell’s theory that all social epidemics – whether good (reducing crime in NYC) or bad (suicide) – can be attributed to a few consistent factors: a few key players (connectors, mavens & salesmen), the stickiness factor and context. If you’re in marketing, your life (or at least your paycheck) depends on how well you can motivate people to do a particular action. Aside from enjoying his theory in general, I found his case studies fascinating. In particular, the study about the three broadcasters for ABC, CBS and NBC during the 1984 presidential election and the potential influence facial expressions had on their viewers. It was also interesting to learn more about how NYC decreased their crime rate. This is something that got a lot of media attention, but ‘how it happened,’ not so much. I do feel I’m late to the Malcolm Gladwell party, but at this point, I’m just glad I’ve arrived. I’ve already heard that The Tipping Point – while great – is not most people’s favorite of his books, but it is the one I had easy access to, so it was my first. How motivating to know that the best is yet to come! BTW, I scored a 41 on the connectors test… not bad, but not as high as would have liked or thought. Oh well. What about you – did you take it & what was your score?